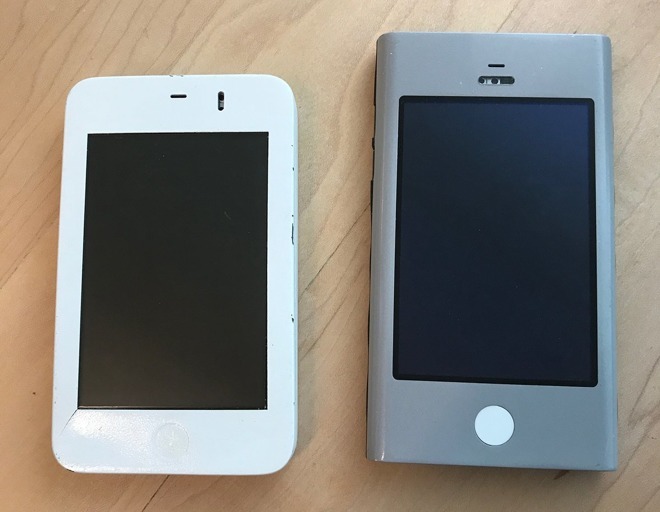 A new image shows a pair of early iPhone prototypes used during the creation of the device's software, allowing developers to build the revolutionary touchscreen keyboard that, back in 2007, was actually controversial. While in 2017, virtual keyboards on smartphones are an assumption, 10 years ago Apple's decision to no include a physical keyboard was seen as a detriment to the device. Human interface designer Ken Kocienda and his team had to get Apple's software keyboard right for the iPhone to become a success. Celebrating the iPhone's 10th anniversary on Thursday, Kocienda took to Twitter to share a picture of two early iPhone prototypes. There he revealed that employees working on the top-secret project called the clunky pre-release development hardware "Wallabies." "The iPhone was a great project to work on and a great team of people to work with," the iPhone software keyboard creator wrote. "Happy 10th birthday." Early iPhone prototypes have been revealed before, most notably via Apple's patent lawsuit against Samsung. Earlier this year, an early iPhone OS concept was also discovered. Kocienda said the prototype devices he showed off actually sat in his desk drawer at Apple for years, until he left in May. His tweets were first highlighted by The Verge. "When I left Apple, returning this hardware was tough," Kocienda said, "like saying goodbye to old friends."